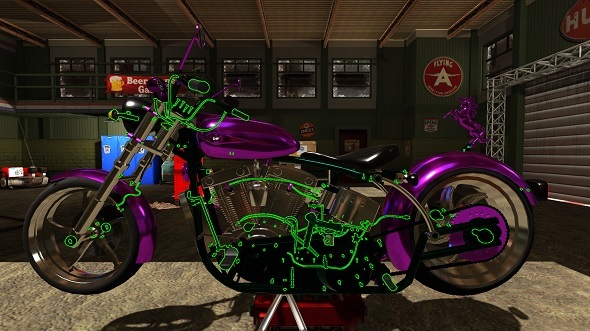 Free games: Build the chopper of your dreams by winning Motorbike Garage Simulator! You know the pain. You’ve got the desire for the low rumble, the leather seat, the wide handlebars, but you have not got the money or space for a chopper. Curses! What you can do, however, is check out Motorbike Garage Simulator to fulfill that dream. We have ten Steam keys up for grabs below. If you’re after more free games then here are some of the best free PC games. Cor! Smell that grease? You work in a chopper mechanic’s garage in Motorbike Garage Simulator. From there, you’re able to build the two-wheeled monster of your dreams – yes, from scratch. You can assemble the frame, put the screws in, and fasten every single part, one at a time. It’s a biker’s dream. Beyond that, you will need to be able to run a cost-effective business, both servicing bikes and exchanging parts in order to earn some dosh. Building that bike of your dreams isn’t free, y’know? By doing these smaller tasks you are able to better learn the ins-and-outs of the chopper so you can make a better one for yourself, too. Practice makes perfect. If Motorbike Garage Simulator is right up your alley (or should that be exhaust pipe?) then you will want to put your name forward to win one of the copies we have of it to give away. All you need to do is enter the competition via the widget below. Every action you complete is worth one entry into the giveaway, and the more actions you complete the more chance you’ll have of winning. We’ll also need your email address so we can send you a code upon winning – we won’t send you spam, we promise. Please read ourterms and conditionsbefore you enter.